While most of what I sell are pieces built to designs I have developed over the years, I am always happy to take on commissions for custom pieces. Below are some of the custom sculpture and furniture pieces I have built. 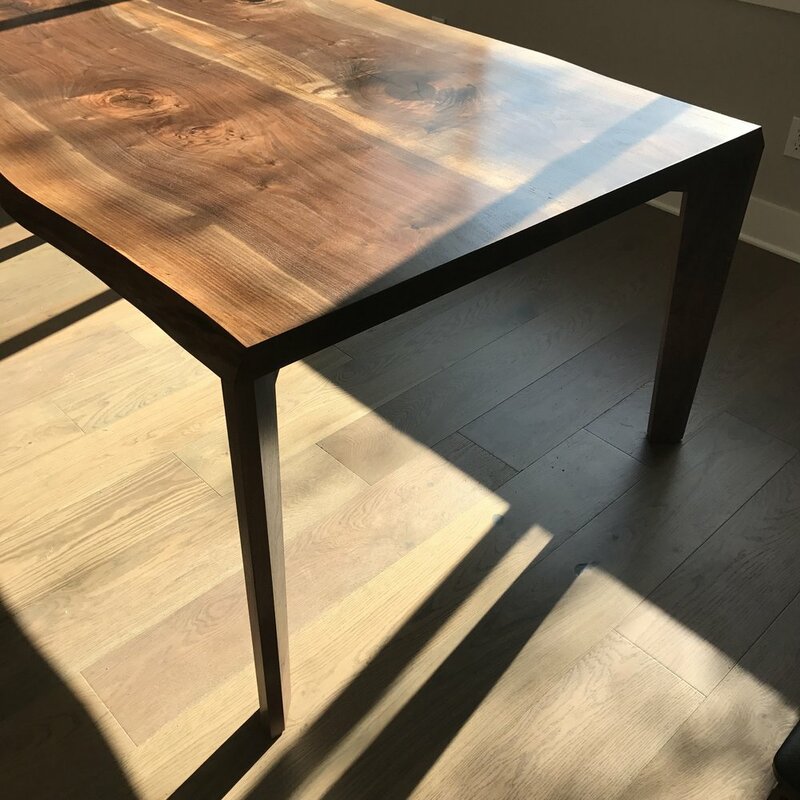 This piece was designed in collaboration with a client during the winter of 2018 and completed in early spring. It is built from a pair of book matched black walnut slabs that are nearly 2 inches thick. The unusual leg alignment maximizes the available room for your knees when seated. Custom made metal brackets that can only be seen by getting under the table ensure more than adequate stability is retained to support the heavy top. This dresser was built for clients who had a specific space for the dresser to fit, and who had seen several other pieces with features they liked. The drawers cant out at the bottom with a finger recess in the lower edge instead of drawer pulls. Sequentially cut boards were purchased for a perfect match between all exterior surfaces. The grain wraps up one side, across the top and down the other side. It sits on short hand turned black walnut legs. Soft close slides will keep the action of the drawers smooth when filled with cloths. This small cabinet was built to be used as a living room side table while also housing a small stereo and having a drawer for cords, a remote control, and whatever else it might collect. The grain from the sides wraps around the miters at the top corners of the piece that sits on short hand turned walnut legs. Soft close slides give the drawer a smooth action. The dimensions of this piece could be easily tweaked for use as a bedside table. This custom Barn Swallow was built for a client who liked the other ones, but wanted one that was a smaller scale. Where most have a wingspan of about 12 inches, this one is only 8 inches from wingtip to wingtip. It would be difficult to keep the same design and go much smaller, but this one was really fun to make. This coffee table with drawer with drawer was built for clients who liked my previous coffee table, but who were interested in a solid top and drawer for things like a tv remote. Visible joinery on this piece includes wedged through tenons on the rails and blind dovetails on the drawer front. This black walnut bookcase was built to balance a traditional with a more modern aesthetic to fit in with the other furniture the client had in his 1920's bungalow. Chamfered edges on the top and baseboard dress the piece up while keeping the aesthetic clean.